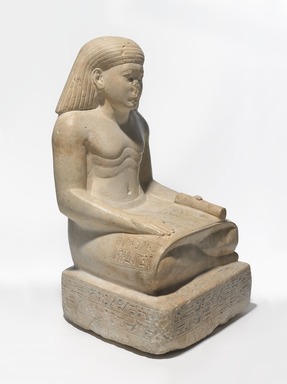 Pale cream-colored limestone squatting statue of Amenhotep, son of Nebiry. Amenhotep is represented with a papyrus scroll unrolled in his lap, and with his head gently inclined as if he were reading. His legs are crossed in the attitude of a scribe. He wears a heavy striated wig, and a kilt. The eyebrows are plastic, but not overly long and extended. They parallel the curvature of the eyelids, and dip towards the root of the nose. The eyeballs are convex, and bulge slightly. The upper eyelid rims are plastic and are contoured by a neatly incised line. The upper lip is straight. The lower lid droops, and there are deep depressions at the corners of the mouth. The folds of the skin on the stomach are indicated. Condition: Nose missing; left eye damaged; small plaster repair at left shoulder.